Life is so much easier if you never waste time hiking across the lab for pure water. Get pure and ultrapure water from one unit, almost anywhere that a tap water source is available. Purchase a WaterPro BT Purification System now through December 31, 2019 and receive one free Filter Pack worth $685. Ideal for laboratories needing 1-10 liters per day. 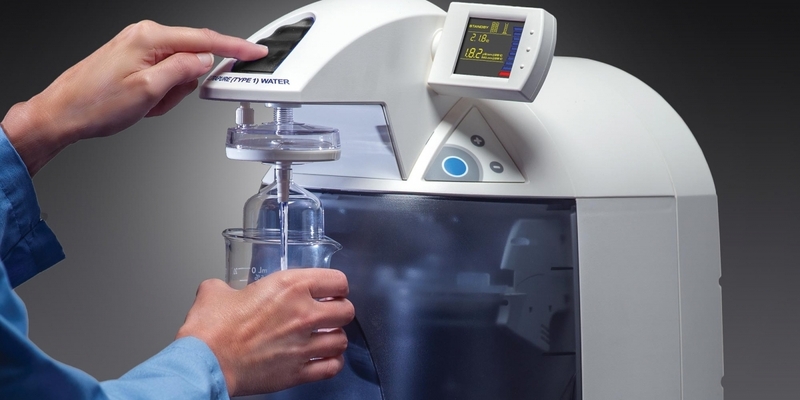 Delivers ultrapure Type 1 water of up to 18.2 megohm-cm at a typical rate of >0.5 liter per minute. Small footprint design for benchtop or optional wall mounting. Optional UV lamp further reduces bacteria and TOC levels necessary for life science applications. Lightweight and is easily installed or moved to share between labs. Claim your free WaterPro BT Filter Pack using this claim form. Only U.S. and Canada customers are eligible. One (1) redemption form must be completed for each WaterPro BT purchased. No limit of number of products purchased. Offer is valid on purchases made through December 31, 2019. Redemption forms must be received by January 31, 2020. This offer is void where restricted or prohibited by law or company policy. May not be valid in combination with other Labconco offers unless stated in writing by a Labconco representative. Purchases made in countries other than the U.S. or Canada are not eligible. Regular shipping charges are included. Product appearance and specifications are subject to change without notice. Allow 4 to 8 weeks after receipt of completed redemption form for delivery of free Filter Pack.